During UK Charity Week we’ve had a look back through the best of the bunch of this year’s charity campaigns. 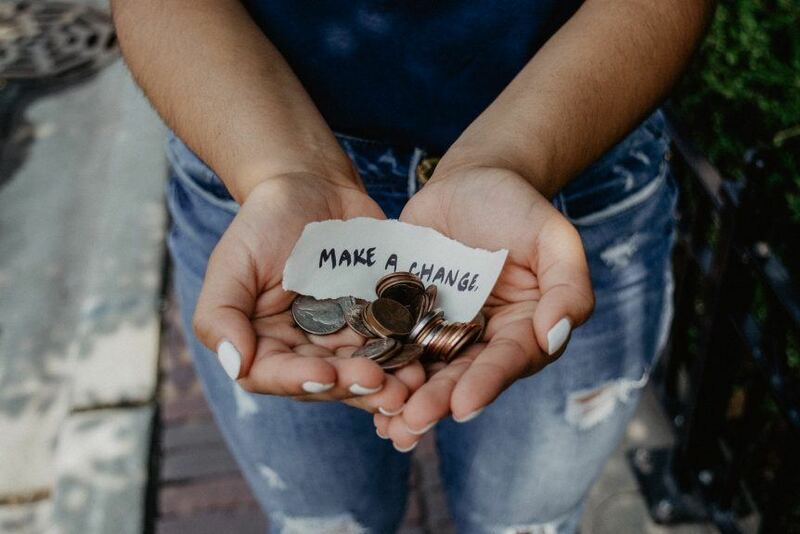 Charity Week was introduced to give awareness to charities and fundraising at the time of year when the spirit of giving means people are at their most generous. Take a look at our favourite four that got us reaching into our pockets. Child Bereavement UK supports families and educates professionals when a baby or child of any age passes away, or when a child is facing bereavement. The campaign ‘One More Minute’ focuses on bereaved families longing to have more time with the person who has died and the loneliness that grief can bring. The campaign was a brilliant way to get people talking more openly about the subject and tackle the isolation that people dealing with grief can feel. 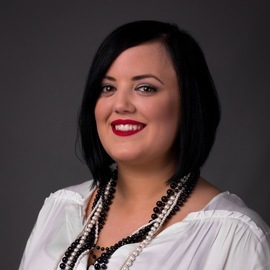 The powerful message they promote is the reason why Busy Bees, the leading provider of childcare for the UK, ventured into a two-year partnership with them. Nurseries throughout the UK have held lots of events throughout the year to raise money for the important work Child Bereavement UK does. Ahead of Children in Need 2017, the children at Chase Grammar School were lucky enough to win a visit from Pudsey the Bear. 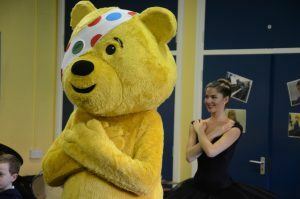 The school asked Pudsey to take part in the four and five-year-old’s rehearsals for The Nutcracker ballet and to enhance the event we arranged for two senior students of the Elmhurst Ballet School to come along and to show off their pliés and pirouettes. The children were captivated by Pudsey and the ballet dancers and the whole of the West Midlands got to enjoy the show on BBC Midlands Today’s evening news, as well as coverage in Staffordshire Living, West Midlands Express & Star plus the Cannock and Lichfield Chronicle. The campaign was a great success and gained some fantastic recognition for the amazing work Children in Need does to help vulnerable children and young people. Dave has partnered with CALM and rolled out a campaign to show viewers how they can help a friend that’s going through a tough time. Part of the campaign outlines the qualities that make a good mate, touching on subjects such as not mentioning that fiver you owe him, not bringing up embarrassing stories, giving honest fashion advice and reaching out via text just to check they’re ok. The campaign actively encourages people, in particular men who are most likely to sweep struggles with mental health under the rug, to text a friend to check their doing alright. The important message is also featured on beer mats and coffee cups which is a great call to action when on-the-go. The issue of mental health is rife at the moment and it’s heartening to see Dave speaking out on the subject and ending the taboo around it. 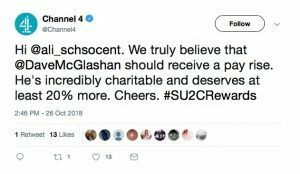 Channel 4 were this year’s hosts of Stand Up To Cancer and in the lead up to the night, they took to Twitter to dish out some comedy gold. The organisation released a donation menu on their Twitter page the day before the event, outlining the different tasks the account offered to perform in exchange for donations to the charity. For £5 you got a Twitter follower, for £10 they would ask out your crush for you or insult you. For £20, the account would rate your cooking, retweet you or ask your boss for a pay rise. For those trying to enter the industry, for £250 a commissioner would give feedback on a TV show pitch. The most entertaining tweets were some foul-mouthed insults aimed at Piers Morgan, which was widely publicised on social media and in the news, gaining some great publicity for the charity.